and who as music lovers gravitate to the pure joy of the live musical experience presented by the very best classical musicians. About Midwest Mozart Festival, Inc. This year marks the 31st year the accomplished musicians of the Midwest Mozart Festival orchestra will perform at the Woodstock Opera House and other venues. Midwest Mozart Festival, Inc. is a non-profit organization with world-class musicians who present classical music performances of the highest caliber, with a particular focus on works of the great Wolfgang Amadeus Mozart. Midwest Mozart Festival is McHenry County’s only resident professional orchestra! 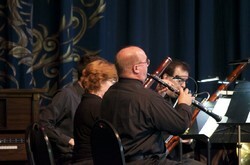 Concerts – Provide classical music performances of the highest caliber. Culture – Offer the unique cultural experience of fine music to a diverse public audience at an affordable price. Community – Extend support and assistance to the communities in which we perform through partnerships with local businesses and active participation in local economic development programs. Another significant goal is to interact with and support music students in schools and other educational facilities through our Youth Music Education Program. The work of this remarkable group of musicians does not stop at incredible performances. Besides providing concerts and the cultural experience of fine arts, our youth-serving mission strives to promote and encourage music education. All Midwest Mozart Festival concerts offer youth & student tickets available at a significantly reduced price, or for free based on sponsorship availability. Midwest Mozart Festival musicians deliver support to local school systems by volunteering at summer music camps. Musicians from our orchestra also play alongside music students at sponsored events and hold student/professional musician concerts afterward. Over 70 percent of our musicians are also professional music educators! Midwest Mozart Festival came on the scene in 2016 as an outgrowth of a former organization. As a result, the same outstanding musicians returned to continue a storied tradition and celebrated their 30th Anniversary Gala Concert last year at the Woodstock Opera House.